If you own a power drill, you'll need a good set of brill bits. The fibe best drill bit sets, compared and reviewed. If you own a power drill - then you'll struggle without a good quality set of drill bits. They're designed to create holes in a variety of mediums - wood, metal, masonry and more, and there's a world of choice available. Depending on what you need a drill bit for is half the decision on which set to buy. There's no point buying masonry bits if all you're ever likely to do is spend your days woodworking and using other woodworking tools. The five best drill bit sets are featured below. The cover the range of bits available, and are great value for money power tool accessories. All are highly rated, well received and manufactured to a high quality. 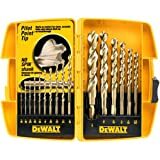 This is the best selling set of drill bits - and depending on who you listen to will depend on whether you're impressed enough to buy it. Well .- listen to me and you may then consider it a worthy purchase. For one you're getting a broad ranging chrome vanadium set of bits for less than 15 bucks and for two - there's plenty to go at. The bits will work with either wood or steel pieces and they slot in and secure easily enough. They're all housed in a good enough plastic tray and providing you know how to fit them into the handle they do a pretty impressive job when you apply the torque. Not a set to be sneezed at - far superior than they should be for the price tag. 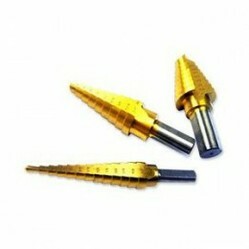 This is a good collection of drill bits and the second best selling set around. For the price, you get a range of both power bits and screwdriver tips, which should cover most basics for the average user. The Quik-Lok system (the chuck) is incredibly easy to use - a simple task of swapping and locking the bits in place - and the Titanium bits are as hard as it gets - tough, durable and work well with wood and any number of small tasks . The screwdriver tips are manufactured from top quality S2 steel and their strength is apparent when you set them to work. Good quality construction, solid components, priced right for the set. These Bosch drill bits are another top selling set - manufactured from titanium, housed in a sturdy case and good for a range of general purpose tasks. From a users perspective, titanium is a great material and I've always found that titanium bits are as solid as all the hype says they are. Depending on what you put them through, they tend to have a longer shelf life and have a tendency to drill with a reduction on the chewing and splintering you can get with other steel bits. The size range is pretty good - there's enough bits to keep the average guy happy and they're certainly more than good enough for use around the home. Nice quality basic set and at just over 20 bucks they're more than affordable. This is an incredibly good set of drill bits and don't let the fact that there's only three put you off. They're top quality bits and will easily punch through a range of materials - wood, plastic and metal and they certainly come in handy more than you'd give them credit for. They're impressive in how tough they are and the their shape makes them a good choice for clean drilling time and again. They're a drop forged steel manufacture, coated with titanium nitride, which adds to their all-round durability and each one will drill through a small range of hole sizes. An effective, compact and efficient set of bits - for less than 10 bucks. This is the final top selling set of drill bits for steel - basically their designed purely for drilling through a variety of metals. The kit includes 29 bits, ranging in size from 1/16" up to 1/2" and they're all presented in a good quality made-to-measure case that's more than good enough to stow in the bottom of the tool bag. They're a simple job to swap and secure, cutting out down time and the results you get when using them are rapid, accurate and clean. They're manufactured from cobalt - plenty of edge and toughness and they're the set to buy if you're looking for an industry standard box of metal bits. Don't let the price put you off - this set will still be going strong long after your drill needs replacing.